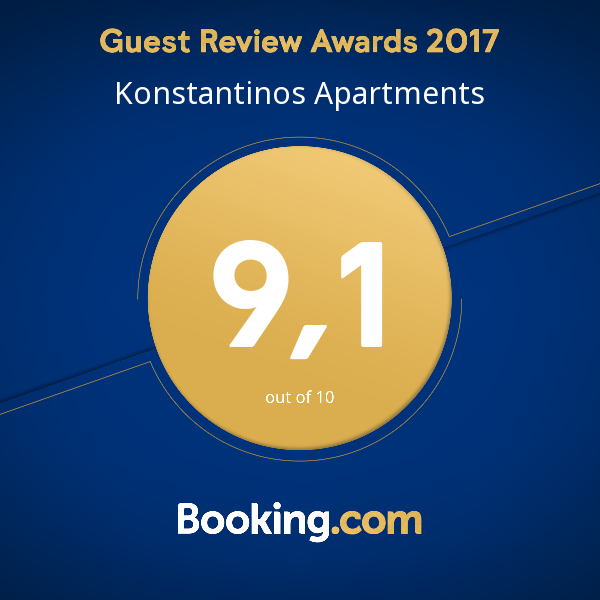 Konstantinos Apartments are conveniently situated in a quiet street within the lovely harbour village of Agia Efimia and just 50 meters from the beach, shops, restaurants and tavernas. Agia Efimia is located in the enchanting Pylaros Valley area of Kefalonia - an area designated as being of outstanding natural beauty. Located on the east coast of Kefalonia, this is a fabulous base from where you can easily explore the rest of the island, both the north and south of Kefalonia are no more than one hour away by road. The traditional architecture, the hospitable residents, the magnificent sceneries, the picturesque bay with the fish taverns, the restaurants and entertainment shops, the endless view of the Ionian Sea and the island of Ithaca , the green landscapes and the crystal waters, create an ideal place for the summer holidays. In the summertime many sailing boats gather here to find supplies and a good rest from the more frequented places of the Ionian. Agia Efimia consists of a collection of tranquil bays with beautiful pebble beaches. “Konstantinos Apartments" in Kefalonia are 150m from these beaches, making them easily accessible on foot. A few minutes walk from the apartments brings you to the local diving centre. Using Agia Efimia as a base you can plan local excursions to visit Melisani Lake which is about 15 mins drive away near the village of Karovomilos with its duckpond and waterwheel. A few more minutes drive brings you to the port of Sami which has ferry services across to Ithaca and the Greek mainland and a selection of shops and restaurants.